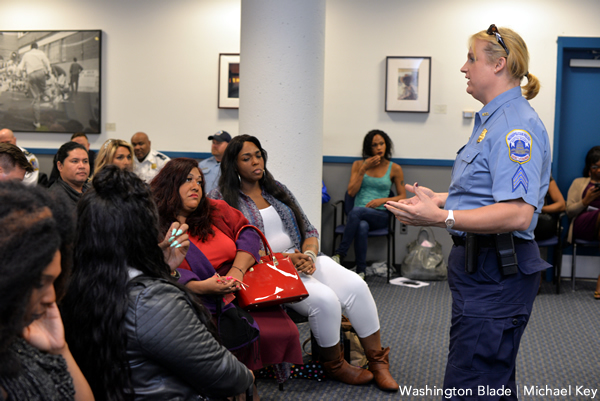 May 13, 2016 at 10:41 am EDT | by Lou Chibbaro Jr.
D.C. and Metro transit police officials told nearly 100 people who turned out Wednesday night for an LGBT Public Safety Meeting at the Reeves Municipal Center that the two departments work hard to apprehend criminals that target the LGBT community. Sgt. Jessica Hawkins, supervisor of the D.C. Metropolitan Police Department’s LGBT Liaison Unit, and Deputy Chief Kevin Gaddis of the Washington Metropolitan Transit Authority, or Metro, Police said officers of their departments receive ongoing training to help them better address the needs of LGBT crime victims. The two said their respective departments are aware of how the transgender people in the city, especially transgender women, have been and continue to be targeted for violence, including hate crimes. More than a dozen officers and officials from the two departments, including MPD Captain Cheryl Crawley, who oversees the LGBT Liaison Unit, either spoke or attended the meeting to listen to the concerns of LGBT community members. A statement from the Mayor’s Office of LGBTQ Affairs says the event was organized jointly by that office and jointly hosted by the two police departments in cooperation with the Trans Women of Color Collective, Casa Ruby and the local advocacy group HIPS. The purpose of the meeting was to “equip the LGBTQ community with information and resources to stay safe,” the statement says. Sheila Alexander Reid, director of the LGBTQ Affairs Office, and Terrence Laney, the office’s deputy director, said the meeting, among other things, was intended to provide information to the community about services for crime victims that many in the LGBT community may not know about. In a slide presentation, Courtney Fisher, Deputy Director of Victim Services at the D.C. Office of Victim Services and Justice Grants, told about a wide range of services offered by her office for which LGBT crime victims could be eligible, including emergency housing, mental health and medical care and financial assistance. She said the office has programs to provide immediate assistance to victims of sexual assault and intimate partner violence. “All programs are 100 percent free of charge,” Fisher said. A separate program run by the D.C. Superior Court, the Crime Victims Compensation Program, also provides direct financial assistance to crime victims, Fisher and others said. Following presentations by Fisher and the police officials, longtime transgender activist Lourdes Ashley Hunter, chief operating officer for Casa Ruby, served as moderator for a discussion with two trans women and a trans man who spoke about their personal experiences facing anti-trans discrimination and violence. What a crock of made-for-LGBT-news *PR bullshot* from Bowser’s LGBT paid political hacks at her discriminatory LGBT office. That goes for Chief Lanier’s discriminatory MPD, and its so-called LGBT “Liaison” Unit. Why does it appear that this was really a secretive, highly-controlled ‘Public Safety meeting’– intended *by* and *for* mostly transgenders only? DC’s LGBs need not attend? Why was that, Mayor Bowser? Chief Lanier? Would LGBs ask too many tough, embarrassing questions about anti-LGBTQ hate crimes enforcement and the destruction of LGBTLU police services to the entire LGBTQ community in DC? You know– that would be the questions that DC’s paid political hacks do not ask. Wasn’t this really just a sham, cherry-picked ‘PR meeting’– which was *NOT* publicly promoted, weeks in advance, as most legitimate civic meetings are? Why? To discriminate against LGB crime victims in DC? Is there a manufactured transgender bias against LGB police services by Groomes and Lanier– and their boss, Bowser? How about MTP Dep. Chief Gaddis and his bosses at Metro Transit Police and WMATA/Metro, Pavlik and Weidefeld? Indeed, when has WMATA/Metro done ANYTHING to welcome its DC LGBTQ passengers and visitors? When was the last time WMATA/Metro advertising in its cars reminded riders that hate crimes are subject to prison time in DC? 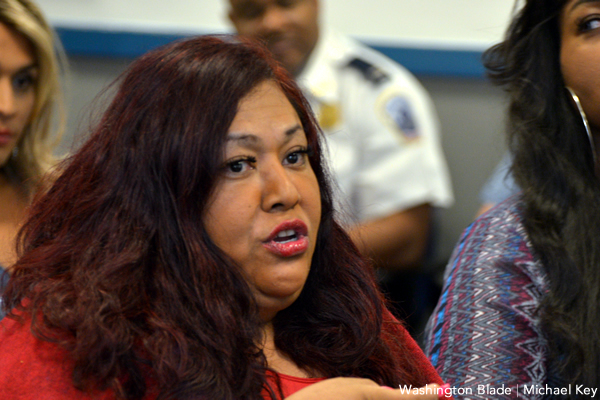 Metro’s systemic Homophobia and Transphobia persists with this sham event. Why the secrecy from the mayor? Did the Blade and MW get press releases a few weeks in advance about this meeting from Bowser/Alexander-Reid? Was The DC Center invited to attend and promote this so-called ‘public safety’ meeting? If public safety is so important for ALL LGBTQs in DC, why didn’t Lanier/ Groomes/ Hawkins also send press releases well in advance to the Blade, MW and The DC Center? For that matter, why didn’t Lanier/Groomes/Hawkins also send press releases well in advance to the MPD’s SEVEN district listservs throughout the city? And if LGBTQ public safety for ALL LGBTQsis so important, why didn’t Lanier/Groomes/Hawkins also send press releases far in advance to the nearly 700 members of Capitol Hill and Ward 5/ Brookland LGBT listservs? Wasn’t that meeting notification negligence intentional? So as to reduce attendance to just a chosen few, Bowser/Lanier-friendly, *in-the-know* attendees? How many of the attendees (and quotes from same) came from DC employees with generous salaries or fat city contracts/grants? And, BTW, how much do the quotable “LGBT leaders” in this story get paid from the city? Shouldn’t that be noted for DC’s LGBTQ taxpayers as a matter of routine news disclosure? It begs the question, would these LGBT officials and contractors get paid at all if they did not say such syrupy, sweet nothings about their DC political benefactors– and their sham PR meetings? WHAT was the real message from Bowser/Lanier– and their mouthpieces at DC OLGBTA and MPD LGBTLU?